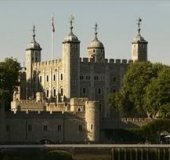 1 William the Conqueror had built castles all over England. The country was securely under his control, but there were still a few problems with the castles. Attackers kept burning down his wooden castle walls and even his wooden towers. If a castle wasn't burned down, the wood started to rot from the damp English climate. 2 So, William set out on an even more ambitious plan of castle building. He began to build stone keep castles across England. Sometimes, he replaced the old wooden keep with a sturdy stone one. Sometimes, he built a whole new castle. 3 Stone keep castles were far superior to the old castles. Built of solid stone, they were permanent structures meant to last for centuries; some of them still stand today. With their thick stone walls, stone castles were built to resist any missiles that an attacker might throw at it. Stone keep castles could also be built taller. This made them better observation posts, since people inside the castle could see the enemy approaching from far away. This gave them more time to prepare their defenses. Stone keep castles could also be built larger. More people could live inside, and the activities that took place inside the castle wall could be expanded.